These classic movies offer big names and design inspiration from typography, street art and more. We all love a good movie, but rather than tune into the latest action film or comedy, why not take a look at some of the many awesome design movies and documentaries out there? There’s nothing better than seeing what some of the great designers have done to help boost your creative ideas and spur you on. With new for 2017 Netflix series Abstract: The Art of Design booming, it's clear there's a huge appetite in the design community for films about other designers and areas of design. So in no particular order, here’s a rundown of 10 of the best classic design documentaries to catch, featuring famous names and inspiring stories, covering everything from typography to street art. 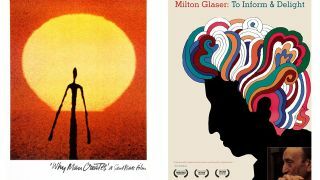 Seminal artist Saul Bass and Mayo Simon created animated short documentary Why Man Creates in 1968. An early classic, the film discusses the nature of creativity and is as much inspiring today as it was 50 years ago. American director Gary Hustwit celebrates 50 years of the typeface with a feature-length documentary focusing on the wider conversation about how type affects our culture. Released in 2007, the documentary has received widespread recognition and been shown at over 200 film festivals, museums, design conferences, and cinemas worldwide. Directed by Mu-Ming Tsai, Design and Thinking examines how design can influence the world of business and social change and calls on creative minds to work together to change the world. Interviewees David Kelley, Bill Moggridge and Tim Brown put forward the idea that attempting to ask the right question is more important than providing firm answers. Following on from Helvetica, Gary Hustwit’s second film looks at the world of design engineering and the creative concepts behind everyday objects such as toothbrushes to tech gadgets. He also completed a trilogy with his third film, Urbanized, which looks at the design of cities. Wendy Keys’ debut documentary offers a glimpse into the brain behind the iconic I ❤ NY logo and New York Magazine. Released in 2008, the film illustrates the full-breadth of Glaser’s artistic work and has become a design docu classic. Directed by David Dworsky and Victor Köhler, PressPausePlay interviews with some of the world's most influential creators of the digital era to ask: Does democratized culture mean better art or is true talent instead drowned out? Christina Clausen plays homage to Haring’s iconic career, told through archive footage and a series of interviews from the likes of Jeffrey Deitch to David LaChapelle to Yoko Ono. This pay-per-view documentary from Faythe Levine and Sam Macon depicts the fascinating stories of more than two dozen sign painters working in cities throughout the US, celebrating the specialised art form. A documentary depicting the art scene of 1940s America, The Cool School tells the story of how a small group of creatives gave birth to the LA art scene. Walter Hopps and Irving Blum, owners of the Ferus Gallery, painters Ed Ruscha and John Altoon, and architect Frank Gehry are just some of those featured. Directed by Aaron Rose, founder of the now-closed Alleged Gallery in New York City, Beautiful Losers depicts the work of a 1990s collective that championed a 'do-it-yourself' style - influenced by skateboarding, graffiti and hip hop.